With the evolution of building science and increased concern for energy efficiency, DeVere Insulation Home Performance was born. DeVere Insulation Home Performance brings together expert installers, a team knowledgeable in building science and the best auditors in the area to improve the energy efficiency of new and existing homes. We are proud to have received this award every year since 2012! The Century Club Award, offered by the U.S. Department of Energy, recognizes our organization as one of a select few that have improved the energy efficiency of 100 or more homes in the past year through the Home Performance with ENERGY STAR Program. Home Performance with ENERGY STAR, sponsored locally, offers homeowners a comprehensive, whole-house approach to improving energy efficiency and comfort, while saving money on utility bills and helping protect the environment. For more information visit: http://www.energystar.gov/homeperformance. This is our third year in a row winning this sought-after award! We are so proud of our team for delivering exceptional service to our customers. We are proud to be part of a true American industry. 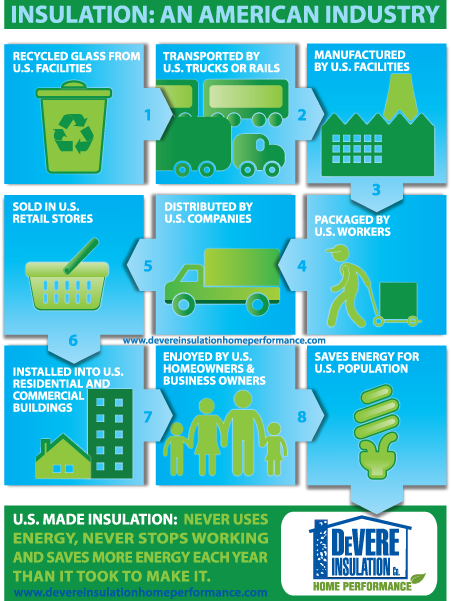 Fiberglass insulation supports the U.S. economy, businesses and jobs from beginning to end. Save energy, save money, support American jobs by hiring an insulation contractor! Did you know upgrading your insulation could do all that?